The jackets have a drawstring through the hood, which poses a strangulation hazard to children. This recall involves about 1,300 Foursquare hooded jackets with drawstrings in boys' and girls' sizes XS, S, M, L, and XL. 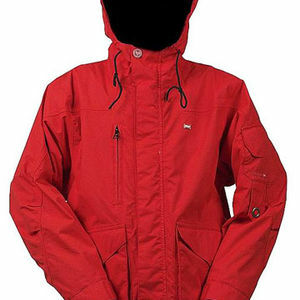 The jackets come in various colors and patterns and have a logo showing four adjacent, vertically offset squares on the sleeve, waist, breast, and/or back of the jacket, depending on the specific model. Snowboard, ski, and sportswear stores nationwide from June 2008 through November 2008 for about $125. Immediately remove the drawstring from the sweatshirts or contact Foursquare for a full refund. For additional information, contact Foursquare toll-free at (877) 327-4484 9 a.m. and 5 p.m. PT, visit Foursquare's Web site at www.foursquareouterwear.com, or e-mail info@theprogram.com.